Swedish cuisine includes a lot of fish and seafood. And this is even more important on the west coast of Sweden where stands Göteborg. 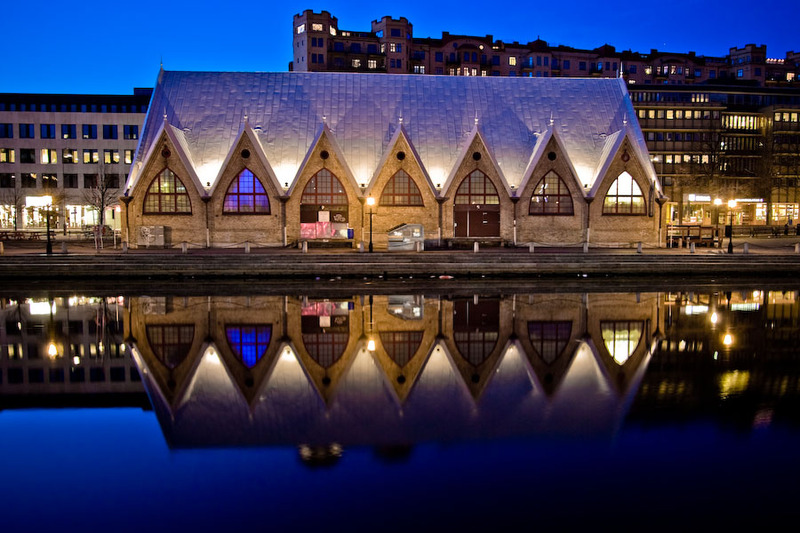 fiskekyrkan (the church of fish) is the city market dedicated to all sea products. It is one of best known place of the city. For this pic, I used a wide angle 10-22mm lens. The camera was set on the tripod in order to be stable during the long exposure shot. I then took the pic about 30 minutes after sunset in order to have this nice cold blue light that make a nice contrast with the electrical light. great reflection and colors. i've read somewhere that this blue is caracteristic in scandinavia, is it? I use this photo on our groupsite on facebook and I hope it`s OK. If not - Tell me and I remove it. I linked the photo to Your website.